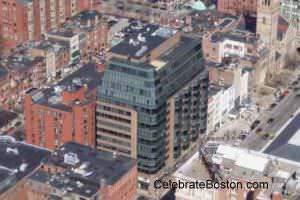 One Exeter Plaza, located at Boylston & Exeter Streets, was at one time popularly nicknamed the Darth Vader Building. It is an attractive office building in the Back Bay. The structure is much taller than the surrounding buildings, is not constructed of red brick or brown sandstone which is prevalent in the neighborhood, and has a high mansard roof, all of which contributed to giving it such an imposing nickname. The 15-story building was constructed in 1984, and was designed by Jung-Brannen Associates. The site was formerly occupied by a drab parking lot. About 211,000 square feet of office space was actually produced from this small site, at a cost of $30 million dollars. The building has a beautiful marble lobby. A Boston Preservationist once commented that the biggest drawback of the building is that it disturbs the view of the [New] Old South Church's bell tower at the other end of the block. 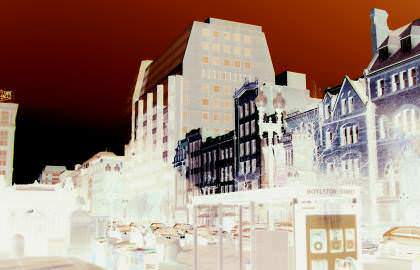 This author concurs, and recalls many old photos of Boylston Street with the Old South's [original] campanile being the most distinctive and beautiful feature of the scene. The least appealing nickname ever coined was Darthzilla, implying "Not Quite Darth Vader, Not Quite Godzilla," as the building rears its head over all others in the area. It was also noted that from One Exeter Plaza you could see the entire Back Bay, but from many Plazas in the Back Bay you could see it. The Darth Vader nickname is a bit unfair; it's just that it is surrounded by older buildings, and is quite taller. Darth Vader is a registered trademark of Lucasfilm, Ltd.
Boylston & Exeter Streets is just one block west of Copley Square, which is considered the bustling center of the Back Bay District. Nearby attractions include the Newbury Street shopping area, Prudential Center, Hynes Convention Center, and Copley Place.